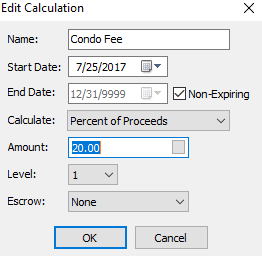 In Lodgical Condo Enterprise the new feature, Unit Specific Charging, allows you to construct separate monthly charges based on unit. Creating an efficient way to schedule monthly maintenance and condo fees. These charges can be calculated from a percentage of proceeds, fixed amount, or based upon a specific type of stay (e.g. owner stay). Once set up, they will directly affect proceeds and show up on the units’ proceed statement. 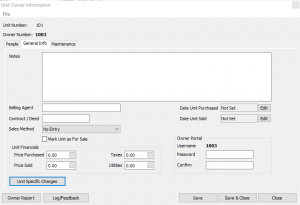 Below are instructions on how to set up Unit Specific Charging on your system. From this window, you can create a name for your charge, the dates you would like the charge to affect, how it will be calculated, and Escrow settings. If you have any questions, call Bay Lakes at 920.746.0606.